A patient in the hospital affiliated with Tianjin Chinese Medicine University threw an axe at his doctor, Kang Hongqian, an acupuncture specialist and a breast cancer victim. This occurred on the 29th of November inside Kang’s office. In 14 separate cases in China patients killed their doctors after receiving treatment, a statistic which makes this well-recognized profession into a dangerous one. The growing anger held by patients toward their doctors first came to light in March, when 17 year old Li Mengnan in the hospital of Haerbin Medicine University rushed into the hospital with a sharp knife. 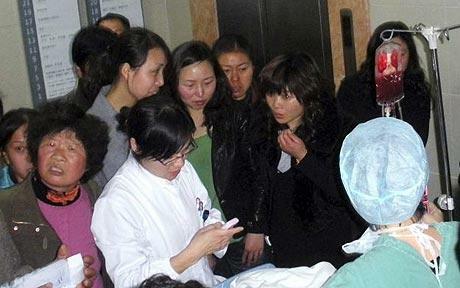 One assistant doctor, Wang Hao, was killed and three other people were seriously injured. In November, four similar cases occurred in different hospitals throughout China; in Beijing, Tianjin and Anhui. The risk of lethal attack is becoming a part of life for every Chinese doctor. For many, it’s difficult to understand the trend of hospital violence. Asked about their point of view, patients say that it is so hard to get good health care from a doctor. Because all of the good hospitals are in the big cities like Beijing and Shanghai, hospitals in the county or in small towns do not always provide the best service or have the best equipment. Since the best doctors are at the best and largest hospitals in the cities, patients have to travel great distances and, often, wait in long lines to be treated. As a result, patients compete against each other for health care services. Patients who have Guanxi, or influence, in hospitals are more likely to receive treatment, resulting in justifiable complaints from patients. Some patients have been reported blocking the hospital’s door or verbally abusing doctors. Many patients expect good treatment since the price of medical care is so high, however doctors in large hospitals shoulder heavy workloads and often don’t have time to provide quality service with enough personal care. This leads to patient dissatisfaction and anger, as revealed in the recent cases of hospital attacks in China. Lin Can, a master’s student in one of the medical schools in Shanghai explained the doctor’s perspective. As a 26 year old man, he is still a student without any income. He can’t support himself and doesn't have time to spend with his family. He regrets the way his family has to suffer while he prepares to become a doctor, and wishes that frustrated patients understood his perspective. A qualified doctor has to undergo a series of tests and obtain at least a PhD, which takes a very long time and lots of hard work. Patients expect doctors to cure every disease, which can be unrealistic since doctors are human, just like everyone else. Doctors expressed frustration with patient irrationality: If a patient is cured quickly, they take their recovery for granted. If recovery takes longer, patients will blame their doctor, assuming that their doctor is keeping them in the hospital to increase the expense of their visit. If there is no cure for a patient’s illness, patients blame the treatment and kill their doctor. One doctor said that if he had it to do over again he would never be a doctor. In China, anyone can go to a hospital whenever they want to. Doctors usually have to work over-time to respond to the steady, heavy flow of patients. Doctors often complain they are not paid very well in light of such heavy workloads and patients think doctors are money driven, and don’t deliver quality health care service. The result is the current system – one where both doctors and patients are unhappy and feel unsafe. In July of this year, The Affiliated Hospital of Honkong University opened its first clinic in Shenzhen. The scheduling procedure in this hospital mirrors those used in western countries, which has attracted the public’s attention and may be a model for the future.